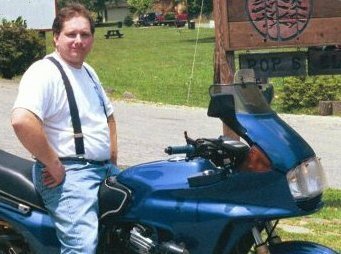 Here's a picture of former TMIOA Webmaster, Colin Goodall (who greatly expanded our website) at Deals Gap during TMIOA Rally IX - 1999 held in Bryson City, North Carolina. Four days after the previous picture Colin was the victim of the classic "Little Old Lady turns Left" accident in Elmira New York. Here's the aftermath. 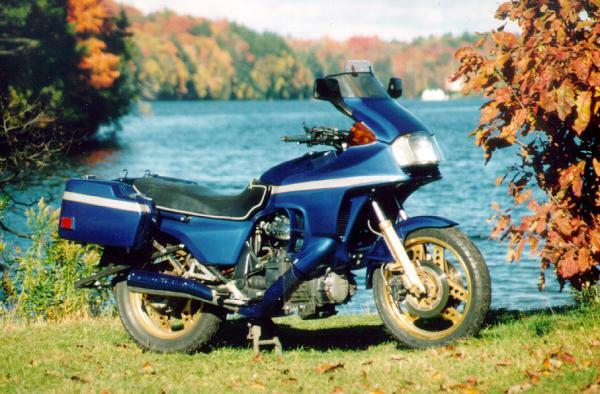 In the fall of 1999 the bike was rebuilt and sported the addition of a set of hard bags taken from a 1983 Silverwing Interstate. (And contrary to rumours spread by certain other TMIOA members, it is _not_ painted Krylon blue!) The bike has over 180,000 kilometers on is still going strong. 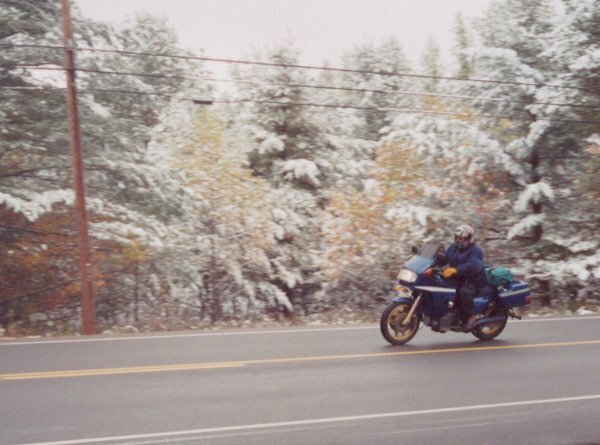 This picture was taken in October of 2001 in Adirondack State Park in New York State. Unfortunately the weather had moved in and resulted in a few inches of snow overnight. The roads were wet but otherwise clear of snow and ice. The temperatures hovered a few degrees above freezing. But the mixture of the fresh snow and fall colors resulted in some beautiful scenery. 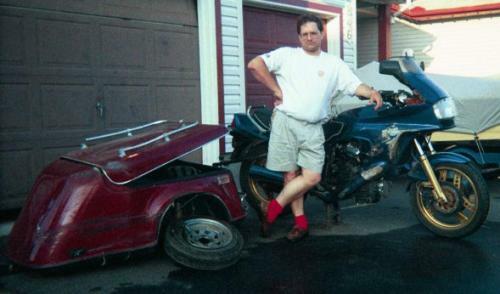 In 2002 Colin completed work on one of his other bikes. 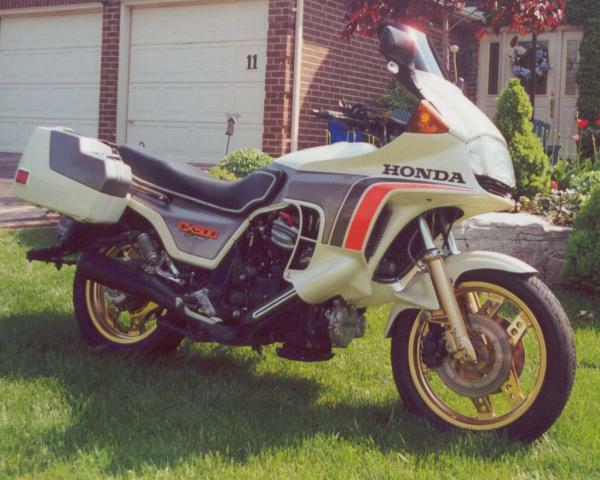 This is the CX 500 Turbo taken to the TMIOA Rally XIII - 2002 held in Dahlonega, Georgia. The bike features a completely rebuilt brake system (pads, all seals and braided steel lines. The suspension was upgraded with a Works Performance shock in the rear and a Progressive Suspension fork springs up front and new steering head bearings. The engine was upgraded with the removal of the entire airbox and placement of a K&N filter on the end of the intake and fresh spark plugs and leads. The bike is also sporting a brand new stator. In 2003 the Mike Chestnut held a fall TMIOA rally at his place in Nashville. Colin and his father spent 4 days travelling through PA, VA, WV and SC to get to the rally. 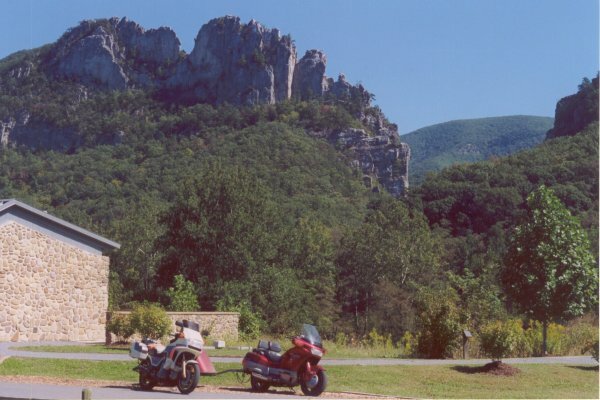 This picture was taken at Senaca Rocks in West Virginia.